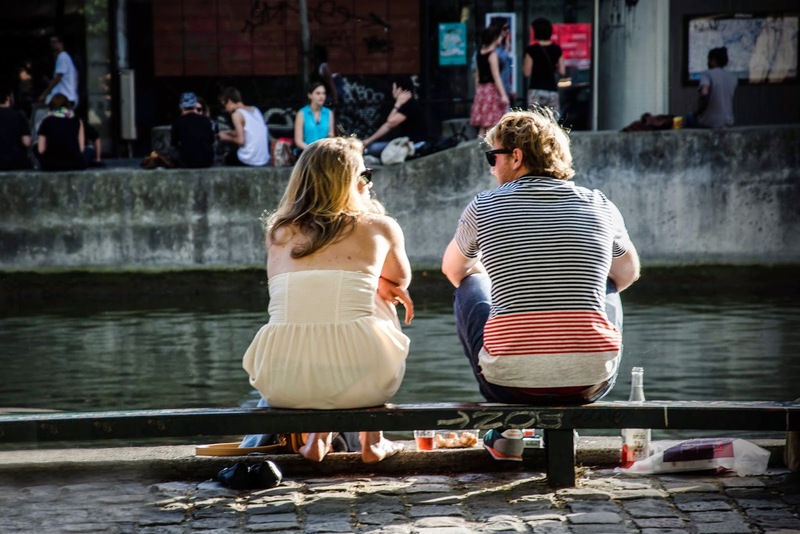 ParisDailyPhoto: Paris upon Canal Saint Martin! I really wish you were in Paris at the moment (well, maybe you are!) for it's one of the best moments to be here. The weather is fantastic, like I said yesterday daylight lasts until almost 11 pm and everybody is out picnicking, BBQing, celebrating (the soccer/football games)... I took this photo last evening on the Canal Saint Martin around which there were a zillion people having a good time. A nice break from the usual Parisian attitude these days! A great place to sit and have a break! You mean Hotel du Nord hotel or really the L'atmosphere? I am enjoying the weather. It invites riding Vélib' instead of Metro. We better enjoy it while it lasts ! Yes - well paybe 10:45 ! No actually you're right, the sun is too high for it to be 10:45/11. It must have been 9 or 9:30. 5:15 is early I agree. But, well, you know that it can only be better!